Is This Ridiculously Cheap V10 BMW M5 Worth Returning To Stock? Cars can reflect one's individuality as much as any article of clothing, musical taste, or sense of humor. But some people, no matter what, will think the funniest comic alive is Carlos Mencia - the same type of person who put this awesome BMW M5 on chrome dubs with subs in the back. Though at this price, it might be worth doing a factory reset. 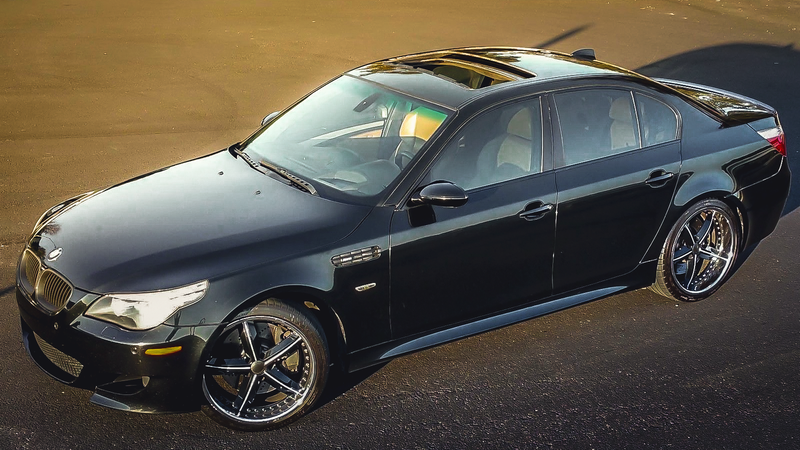 This 2008 BMW M5 is the car that has a love/hate relationship with the automotive community. Fanboys and girls love it for its 5.0-liter V10 producing a monstrous 507 naturally aspirated horsepower and its race-derived SMG 7-speed transmission, but they hate the fact that it has weird rod bearing service bulletins, more-than-infrequent SMG pump failures, and around-town driving habits that are an acquired taste at best. However, if you've ever driven one, you'll know that it shifts harder than most cars on the road today when at full tilt, and although it does have its quirks, it's a hell of a car for the $19,500 asking price. Runs and drives excellent and is as fun to drive as you would think!! With a push of a button, you can reroute the exhaust to bypass the mufflers and this thing sounds incredible! Has all the goodies including, NAV, HUD, SMG 7 speed with triptronic transmission, Heated front and rear seats, Sunroof, DVD player and Boston Acustic 10" Subs in the trunk, Bluetooth and custom exhaust which can be tuned for performance or street by remote! For a fully loaded car that's very likely not to have bearing issues due to the mileage, it's a great price. If you can get over the quirky SMG transmission and love the car for the technological masterpiece it is and get it back to stock spec for a reasonable price, it's a stellar buy for anyone that wants to send their kids screaming and sideways to school, each and every day.